Once you have gitea installed and running you must choose which database to use, certain gitea paths, an admin user, etc. Database Type: Use SQLite3 for the database. Application Name: Give your Gitea server a fancy name. Repository Root Path: Leave this alone. LFS Root Path: Leave this alone. Run User: Leave this alone. Domain: Replace this with your domain name for the server. SSH Port: Leave this alone unless you want a custom port for SSH. HTTP Port: Change this if you want Gitea to serve on a different port. 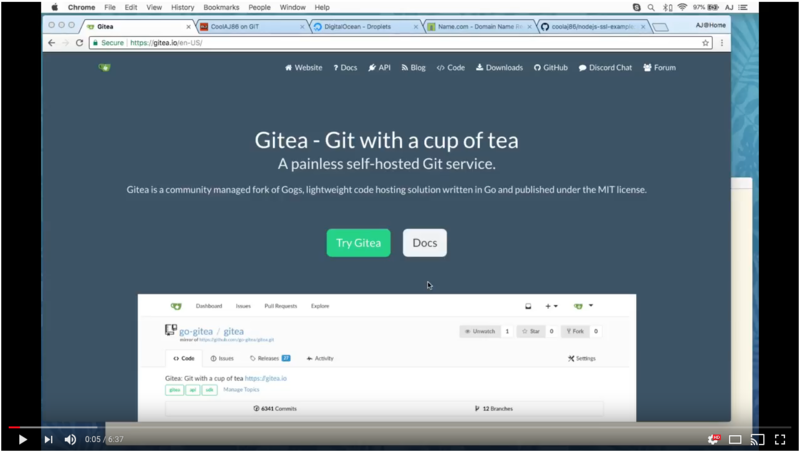 You don’t usually need to, Gitea is usually used behind a web server. Log Path: Leave this alone. Click on “Admin Account Settings” to setup your user account and click “Install Gitea” when you are done. ### Download and install gitea. Replace "amd64" with "i386" for 32 bit x86 or "arm-7" for ARMv7 and "arm-6" for ARMv6. Then see the post-install instruction above. Once a reverse proxy is set up you can change the HTTP_ADDR from the default (world accessible) to localhost-only. All overrides to the existing theme can be placed in the custom/public and custom/templates folders. For many items, such as the logo, you can simply right-click “inspect” to discover the location. For example, the small logo is /img/gitea-sm.png or /opt/gitea/custom/public/img/gitea-sm.png.